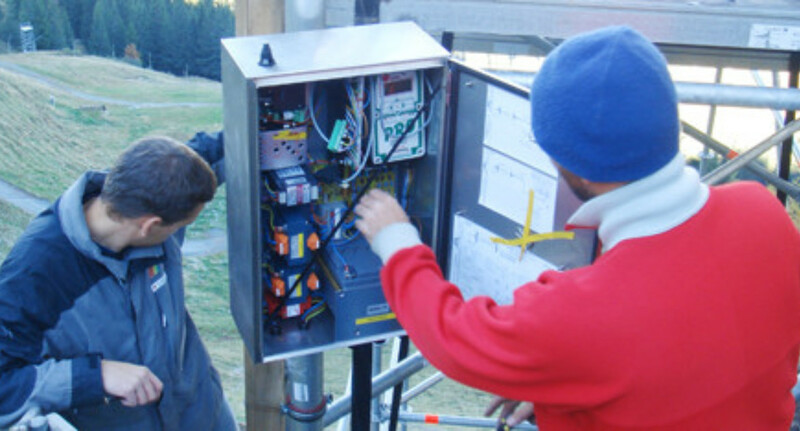 OC HKR requirements demand an extensive meteorological service, which is delivered by ZAMG Innsbruck. It calls for detailed forecasts on race days, for which a general weather report does not suffice. For example, the piste team working assignments have to be scheduled right down to the last minute. During the preparatory phase, compacting snow on the race hill is a particularly precise job. A good temperature curve is required for the use of injection spray bars. Even weeks before the race, it is important to know what type of snowfall to expect and how much. For example, new snow on the traverse section of the Hausberg must be trampled down by foot to prevent avalanches from occurring. Volunteers need to be contacted in good time for this task, which cannot be made using grooming machinery, as it would damage the base of the racecourse. There is a continuous flow of information during the Race Week. First reports arrive in the OC offices at 06:30 hrs and there is a live link with the meteorologists in Innsbruck during the Team Captain’s Meeting at 17:00 hrs. Many phone calls take place in-between. Manfred Bauer, Head of ZAMG in Innsbruck: „A weather station is located right next to the “Mausefalle” (Mouse Trap section), at 1,600 metres above sea level. Here we focus on monitoring wind speeds, which can be dangerous when the racers make long and high jumps. Another important location for wind measurement is at the Seidlalm Jump, at 1,200 metres. The temperature is of particular interest to us here, because this is where an inversion often takes place, in other words, the transition from cold air in the valley to the milder air in the upper section of the course. The third ZAMG weather station is directly next to the Hausbergkante, at 1,000 metres above sea level. It is also very important for assessing altitude related changes in temperature“. Of course, measured data from the course is just as important as weather forecasts. The latest data from meteorological satellites, radar and rainfall prognosis models are constantly analysed at ZAMG Innsbruck offices and prepared for the race Organizers. According to Manfred Bauer, Head of ZAMG Innsbruck: „Our service includes preparing written briefings and making personal phone calls and conference calls several times a day“.